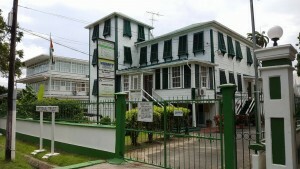 The Walter Roth Museum, Main Street, Georgetown. The Ministry of the Presidency’s main building on Vlissengen Road is set for a major overhaul in the coming months, prompting government to search for alternative accommodation. “Some of these movements became necessary because this building here in which we are is due for renovation works,” Minister of State, Joseph Harmon said. He said the now “cramped” Cabinet room would be extended, works that would affect the functioning of the Office of the President. “You can’t have the President trying to function and hammer and nail going all over the place so the whole idea was that his Secretariat will move from there to facilitate the work to be done,” Harmon said. The Ministry of the Presidency hopes to occupy the Walter Roth Museum of Anthropology on Main Street and the National Trust Building on Carmichael Street- both next to State House – as part of a four-building presidential complex. “It is going to be for a temporary period and that is why … the movement about other building (Walter Roth) had been put on hold…but we will have to make do with smaller spaces but certainly the work which has to be done on this building is basically awaiting that to take place,” he added. National Trust sources have told Demerara Waves Online News that they have been told that they would have to remove to Castellani House, but they have not been given a deadline. 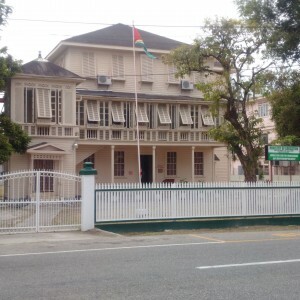 The National Trust, Carmichael Street, Georgetown. The Minister of State said the contract for the Ministry of the Presidency Building has been already awarded and the contractor has already mobilized. “We would like to see it happening very soon,” he said. Amid a public outcry, Minister of Education, Youth, Sports and Culture, Dr. Rupert Roopnaraine announced recently at the National Toshaos Council meeting that the removal of the Walter Roth Museum has been put on hold. Sections of the Amerindian community- a critical voting block- have registered their objection to the removal of the museum and its delicate artifacts along with a more than 7,000-year old skeleton of early inhabitants of Guyana.